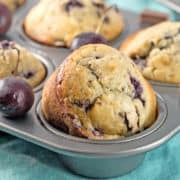 Made with fresh cherries, cherry chocolate chunk muffins are the perfect one bowl, mix by hand, sweet treat for summer breakfasts or snacks. I love fresh cherries. Looooove fresh cherries. Sour or sweet. Dark red bing cherries or golden yellow Ranier cherries. I love them all. Every year, I say I’m going to bake something with fresh cherries… but then I just wind up eating them all instead. I can’t help myself. This year, however — armed with a new 4 at a time cherry pitter (Amazon links are affiliate) and an adorable little 2 year old who loves pulling off the stems and lining the cherries up in the pitter, I finally made my fresh cherry baking dreams come true. It’s almost the end of cherry season (sob!) so stock up while you still can. And by stock up, I mean buy two bags to eat plain and two bags for baking, because four bags of fresh cherries in one week is a totally normal amount of cherries to buy. 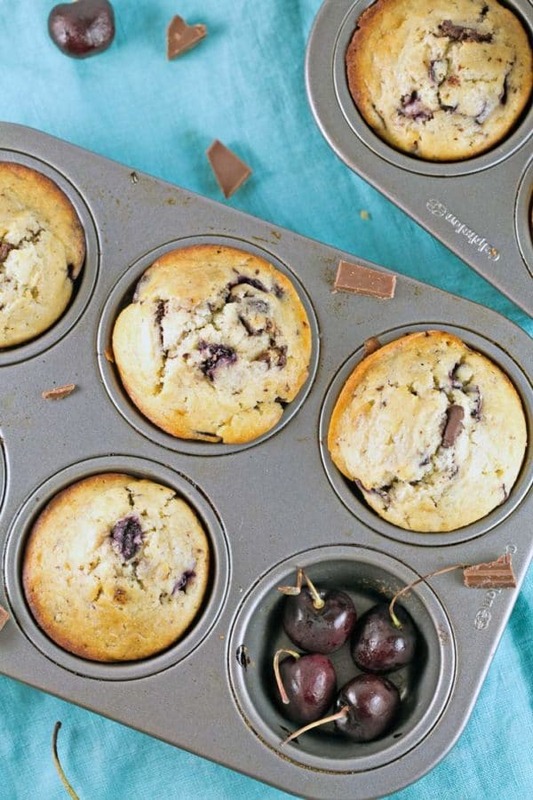 First up, these cherry chocolate chunk muffins. Cherries and chocolate are an A+ combination. Last year, I shared these oh-so-good Cherry Chocolate Chip Cupcakes. Cupcakes are sweeter and sugary-er, and maraschino cherries are perfect for that bright pink hue. 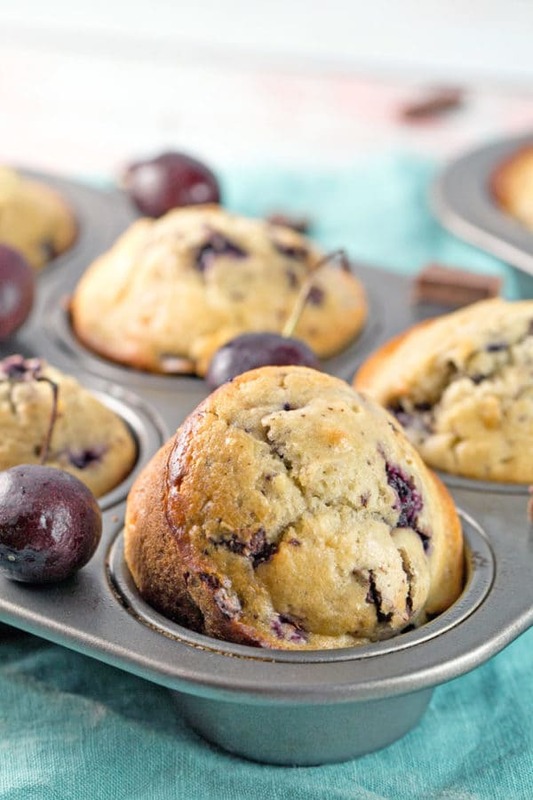 For muffins, however, fresh cherries are perfect. Not so much sugar that it’s wildly inappropriate for breakfast. 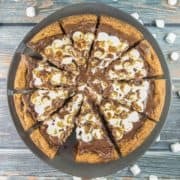 Just enough dark chocolate chunks to qualify as a not-so-sweet dessert. A perfect mid-afternoon pick-me-up. Really, these are perfect anytime muffins. Plus, they’re easy enough to make anytime. One bowl. Mix by hand. Perfect for pint-sized bakers (my 2 year old helped whisk this batch!) 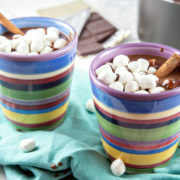 or anyone looking to whip up a sweet treat with minimal effort and time. 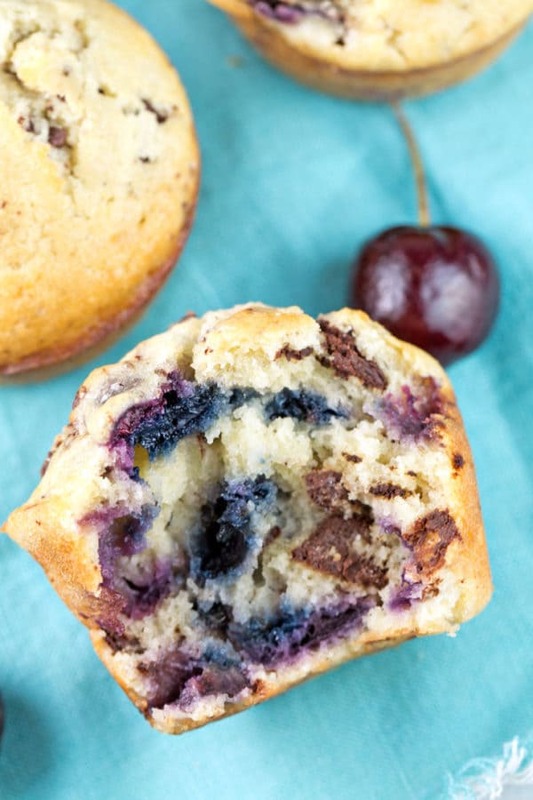 And the best part of this cherry chocolate chunk muffin? It only requires 1 cup of chopped cherries. So unlike a pie, you still have lots of leftover cherries for eating raw. Also unlike a pie: the muffins freeze really well. Bake a batch, pop some in the freezer, and let those fresh cherry flavors brighten a dreary fall day. Because cherry season is short, but sweet for certain. 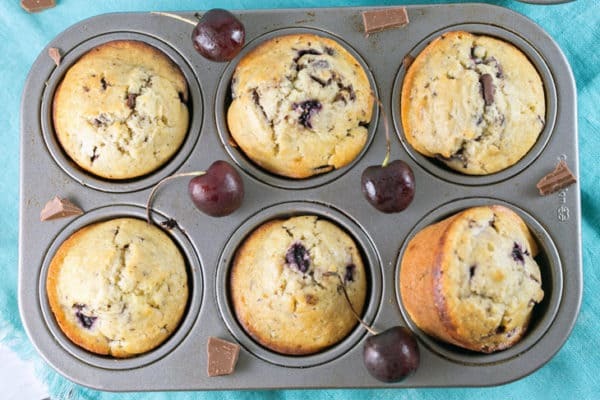 One bowl, mix by hand, vanilla muffins filled with fresh cherries and dark chocolate chunks. Preheat oven to 425 °F. Grease the cups of a 12-cup muffin pan or line with paper liners. Melt the butter in a large, microwave safe bowl, in 30 second increments until fully melted. Cool for a few minutes, then whisk in the milk, eggs, and vanilla. Stir in the flour, sugar, salt, and baking powder, stirring gently just until no dry ingredients remain. Fold in the chopped cherries and chocolate chunks. Fill the muffin wells 3/4 full. Bake 16 to 20 minutes, until a tester inserted into the center of the muffin comes out clean. Cool in pan for 5 minutes, then remove to a wire rack to cool completely. 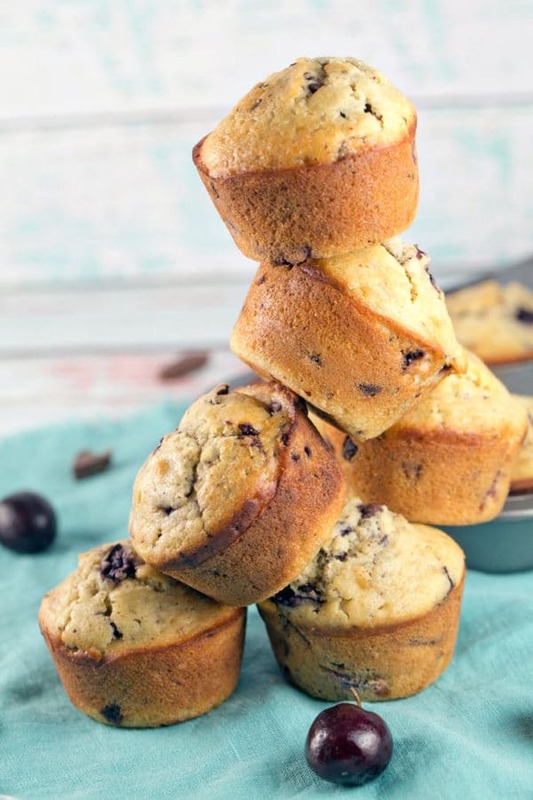 To freeze, transfer fully cooled muffins to a freezer bag and store for up to 3 months. 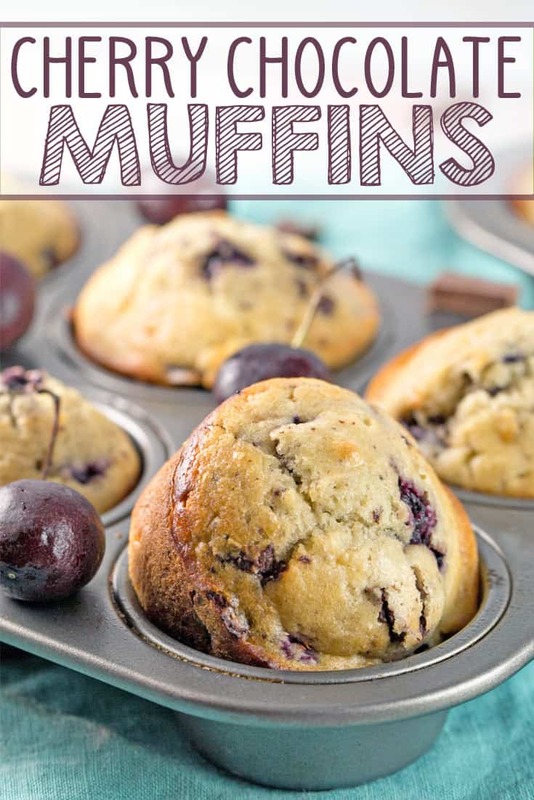 Allow muffins to thaw overnight at room temperature before enjoying. Ummm…. YUM!!!! What an excellent combination! 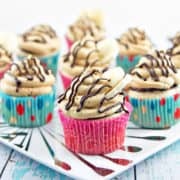 These muffins look to DIE FOR and your photography is simply stunning! Thanks for sharing!